directions throughout the fluid; e.g., if a pressure of 1013.2 millibars is exerted downward by the atmosphere at the surface, this same pressure is also exerted horizontally outward at the surface. Therefore, a pressure gradient exists in the horizontal (along the surface) as well as the vertical plane (with altitude) in the atmosphere. HORIZONTAL PRESSURE GRADIENT. The horizontal pressure gradient is steep or strong when the isobars determining the pressure system (fig. 3-7) are close together. It is flat or weak when the isobars are far apart. VERTICAL PRESSURE GRADIENT.If isobars are considered as depicting atmospheric topography, a high-pressure system represents a hill of air, and a low-pressure system represents a depression or valley of air. The vertical pressure gradient always indicates a decrease in pressure with altitude, but the rate of pressure decrease (gradient) varies directly with changes in air density with altitude. Below 10,000 feet altitude, pressure decreases approximately 1 inch of mercury per 1,000 feet in the standard atmosphere. The vertical cross section through a high and low (view A in fig. 3-8) depicts the vertical pressure gradient. A surface weather map view of the horizontal pressure gradient in the same high and low is illustrated in view B of the figure 3-8. Pressure Gradient Force The variation of heating (and consequently the variations of pressure) from one locality to another is the initial factor that produces movement of air or wind. The most direct path from high to low pressure is the path along which the pressure is changing most rapidly. The rate of change is called the pressure gradient. Pressure gradient force is the force that moves air from an area of high pressure to an area of low pressure. The velocity of the wind depends upon the pressure gradient. If the pressure gradient is strong, the wind speed is high. If the pressure gradient is weak, the wind speed is light. (See fig. 3-7.) Figure 3-9 shows that the flow of air is from the area of high pressure to the area of low pressure, but it does not flow straight across the isobars. Instead the flow is circular around the pressure systems. Pressure gradient force (PGF) causes the air to begin moving from the high-pressure to the low-pressure system. Coriolis (deflective) force and centrifugal force then begin acting on the flow in varying degrees. In this example, frictional force is not a factor. Coriolis Effect If pressure gradient force were the only force affecting windflow, the wind would blow at right angles across isobars (lines connecting points of equal barometric pressure) from high to low pressure. The wind actually blows parallel to isobars above any frictional level. Therefore, other factors must be affecting the windflow; one of these factors is the rotation of Earth. A particle at rest on Earths surface is in equilibrium. If the particle starts to move because of a pressure gradient force, its relative motion is affected by the rotation of Earth. If a mass of air from the equator moves northward, it is deflected to the right, so that a south wind tends to become a southwesterly wind. In the Northern Hemisphere, the result of the Coriolis effect is that moving air is deflected to the right of its path of motion. This deflection to the right is directly proportional to the speed of the wind; the faster the wind speed, the greater the deflection to the right, and conversely, the slower the wind speed, the less the deflection to the right. Finally, this apparent deflective force is stronger at the Polar Regions than at the equator. 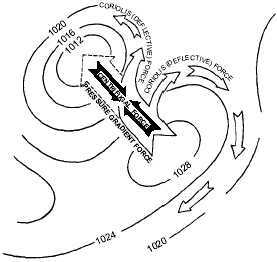 Centrifugal Force According to Newtons first law of motion, a body in motion continues in the same direction in a straight 3-9 1024 1028 1028 H 1020 GRADIENT WIND FLOW GEOSTROPHIC WIND FLOW AG5f0309 Figure 3-9.Examples of circulation around high and low pressure systems.